Tyler Roberts scored his first two goals for Leeds United as the Championship leaders Leeds cruised to a comfortable win over lowly Preston North End. The hosts took a deserved lead before the break when centre-half Liam Cooper headed in from a Barry Douglas corner. Leeds had numerous chances to add to their advantage, with Mateusz Klich firing over and Jack Harrison hitting the post after going clear, before Roberts opened his account for the Elland Road side with a lovely lobbed finish. The Wales international headed home from a Klich cross to round off an excellent night for Marcelo Bielsa's men, while Preston remain second bottom. Brentford's draw at Ipswich means Leeds are now three points clear at the top of the table after a dominant performance. 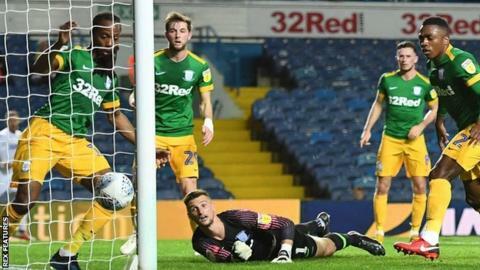 The victory against the only team who had beaten them this season, albeit in the Carabao Cup, ended a run of two successive draws and further underlined the Yorkshire side's promotion credentials. Alex Neil's team, who are now without a win in seven league games, were overrun all over the pitch and could have lost by more but for some wasteful finishing from the hosts. Preston's only bright spot came when Callum Robinson's effort went over the bar at 0-0 and they will look to end their poor run when Sheffield United visit Deepdale on Saturday. At the other end of the table, Leeds will hope to stretch their unbeaten start to the season to nine games when Birmingham City visit Elland Road on the same day. "The first half was very good. The second half at the beginning was harder, then we dominated. "Individual performances were important and our offensive game and defensive game were good. There are few things to criticise in this game. "Our team was very dynamic and what we tried to do made us make links between the movement of players. Players were moving to create space for others and this worked pretty well. "We have to underline the good performances of the individuals. Each one was high." "I'm obviously naturally disappointed to come away losing the game 3-0. "We started the game really well and were on top. Then we gave the ball away on a couple of occasions and that got their tails up. "Their movement is good. We high pressed well in the cup, which is a high-risk strategy, and managed to beat them on the back of it but today we didn't do enough going forward when we had the ball to damage Leeds. When you do that when you play good teams you're going to get hurt at the other end. "We do have to get ourselves out of the rut we're in at the moment." Match ends, Leeds United 3, Preston North End 0. Second Half ends, Leeds United 3, Preston North End 0. Attempt missed. Samuel Sáiz (Leeds United) right footed shot from the centre of the box is close, but misses to the right. Assisted by Ezgjan Alioski with a cross. Goal! Leeds United 3, Preston North End 0. Tyler Roberts (Leeds United) header from the centre of the box to the bottom right corner. Assisted by Mateusz Klich. Substitution, Preston North End. Paul Gallagher replaces Alan Browne. Corner, Preston North End. Conceded by Kalvin Phillips. Louis Moult (Preston North End) wins a free kick on the right wing. Goal! Leeds United 2, Preston North End 0. Tyler Roberts (Leeds United) right footed shot from the right side of the box to the bottom left corner. Assisted by Kalvin Phillips. Attempt saved. Daniel Johnson (Preston North End) left footed shot from outside the box is saved in the centre of the goal. Jack Harrison (Leeds United) hits the left post with a left footed shot from the centre of the box. Assisted by Samuel Sáiz with a through ball. Substitution, Preston North End. Brandon Barker replaces Josh Harrop. Josh Harrop (Preston North End) wins a free kick in the defensive half. Attempt blocked. Mateusz Klich (Leeds United) right footed shot from outside the box is blocked. Assisted by Samuel Sáiz. Pontus Jansson (Leeds United) wins a free kick on the right wing. Attempt blocked. Mateusz Klich (Leeds United) right footed shot from outside the box is blocked. Assisted by Barry Douglas. Attempt blocked. Barry Douglas (Leeds United) left footed shot from outside the box is blocked. Assisted by Kalvin Phillips. Offside, Preston North End. Darnell Fisher tries a through ball, but Callum Robinson is caught offside.